Why the need to speed up banana breeding? Banana, an important staple and source of income for millions of people in 120 tropical and subtropical countries, are by nature sterile crops. They reproduce vegetatively through suckers and this limits the mingling and recombination (shuffling) of genes from the parents to children. Therefore, there is limited diversity in banana growing in a particular region, which makes them prone to the same pests, diseases, and environmental stress. Efforts to develop improved high-yielding and disease-resistant varieties are frustrated by the sterile nature of the plant. This complicates the breeding process making it lengthy and costly—taking up to 20 years to deliver improved varieties to farmers. Moses Nyine from IITA and a PhD student at Palacký University is the lead researcher. 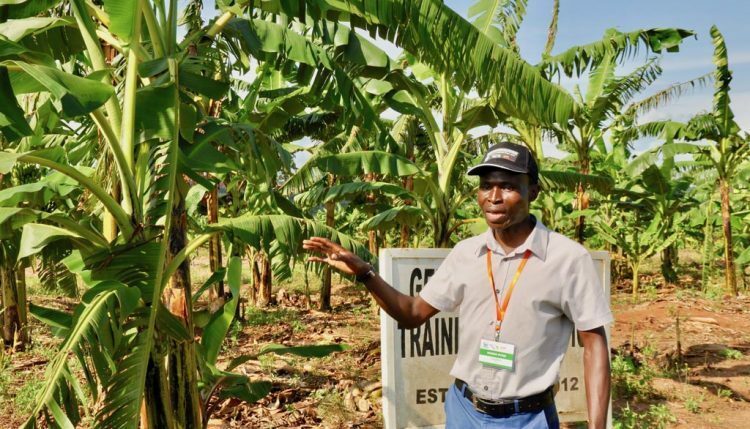 He says the findings of the study present a significant breakthrough for banana breeding in the face of the myriad pests and diseases affecting banana in Africa. These include banana weevil, nematodes, Black Sigatoka, Banana Xanthomonas wilt, Banana Bunchy top virus, and more recently Fusarium Wilt (Panama disease/Tropical Race 4 (TR4) detected in Africa for the first time in Mozambique in 2013. IITA has a comprehensive banana improvement program which has been ongoing for more than 30 years and covers the whole breeding pipeline. It has developed numerous improved plantain varieties, called PITA, and improved highland cooking bananas together with the National Agricultural Research Organization, Uganda (NARO) called NARITAs. These hybrids have been distributed to 15 countries in Africa, Latin America and Asia. 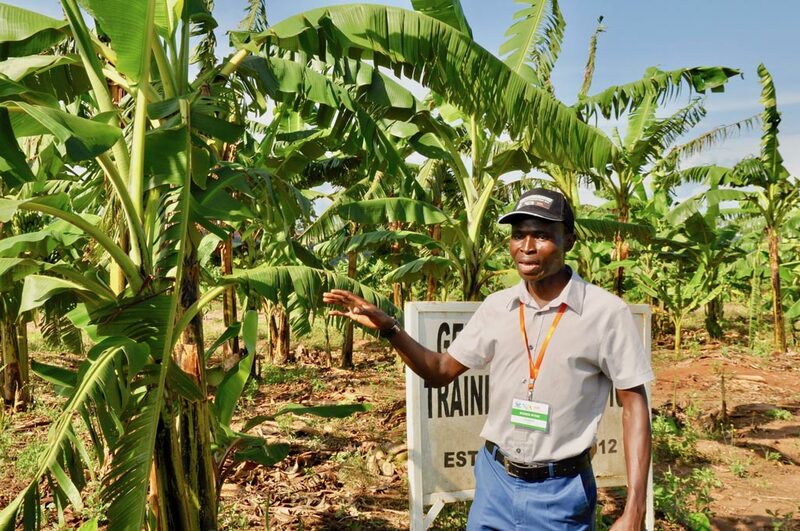 The researchers collected data from the East Africa Highland Banana and their hybrids planted in two fields in Uganda for two crop cycles between 2013 and 2016. In total, 307 banana types of banana were observed under low and high input field management conditions. They collected data on 15 key traits of the crop and grouped them into five categories: plant stature, suckering behavior, black leaf streak resistance, fruit bunch, and fruit filling. Moses Nyine explaining his research in a banana field in Uganda. The DNA differences between the bananas were mapped out using a technology called genotyping by sequencing (GBS). These data sets were then used to test the ability of six genomic prediction models to determine the bananas with the best traits through cross validation. The BayesB model was found superior to other models, particularly in predicting fruit filling and fruit bunch traits. The results demonstrate that genomic prediction is possible in banana breeding and the prediction accuracy can be improved by using models based on data from many different environments. The prediction accuracy within the training population based on genomic estimated breeding values (GEBV) was above 75% even with models that had low predictive abilities. The study was conducted as part of a collaboration of researchers from IITA, the Institute of Experimental Botany; the Centre of Plant Structural and Functional Genomics; Palacký University, Olomouc, Czech Republic; and the Laboratory of Tropical Crop Improvement, Division of Crop Biotechnics, Katholieke Universiteit, Belgium.